At the end of the tumultuous year of 1830, Eugene Delacroix completed a canvas celebrating the symbolic rebirth of the French nation. It was to be a work of enduring appeal, a universal image that has come to symbolize the struggle for freedom over tyranny. The French Republic, born again in the wake of of the July Revolution of 1830 that led to the fall of King Charles the X, is allegoricized in the personage of Marianne, who storms the barricade brandishing the tricolour flag and a fixed bayonet. To this day a monumental statue of Marianne can be seen towering over the Paris square the Place de la R�publique, a lasting reminder of the indelible mark left on the French national consciousness by Delacroix's stirring painting. 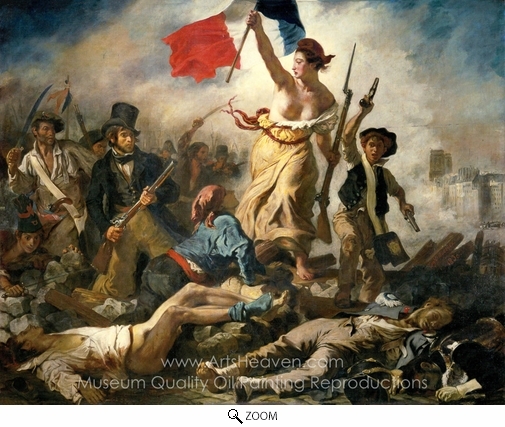 Exhibited at the Paris Salon in May 1831, Liberty Leading the People was not merely the product of a surge of revolutionary idealism and emotion. Rather, it reflected the gestation of ideas that, slowly gathering pace, led to an outbreak of middle-class revolutions across Europe. Driven by Romanticism, an artistic and intellectual movement that reigned from the end of the eighteenth to the middle of the nineteenth centuries, the Revolutions of 1830, 1832, and 1848 were all seen as a response to the idealism propounded by many Romanticist thinkers. Although known for his political neutrality it would have surely come as no surprise then that it was Delacroix that made such a classical icon out of contemporary socio-cultural strife. Recognized at the time as the leading of the Romanticist painters, Delacroix's Liberty Leading the People is an intricate balancing act of heroism and sacrifice viewed through a kaleidoscope of contemporary and neo-classical lenses. Emerging from a cloud of dust brandishing their weapons, a motley crew of citizens burst through the barricades, driven by , and channeling, the fervour of the generation of 1789. At the head of the charge is the figure of Marianne, already framed as a monument at the head of a triangular formation. At the base, her cohorts run to catch her up, articulating in their steps a profound rhythm � an unstoppable momentum. Delacroix's painting glorifies the individuality of the noble citizen. It was perhaps for this reason, or due to its starkly modern and realistic techniques, that the canvas was shunned by the art community who perhaps understood early the propagandistic power of this surging image. 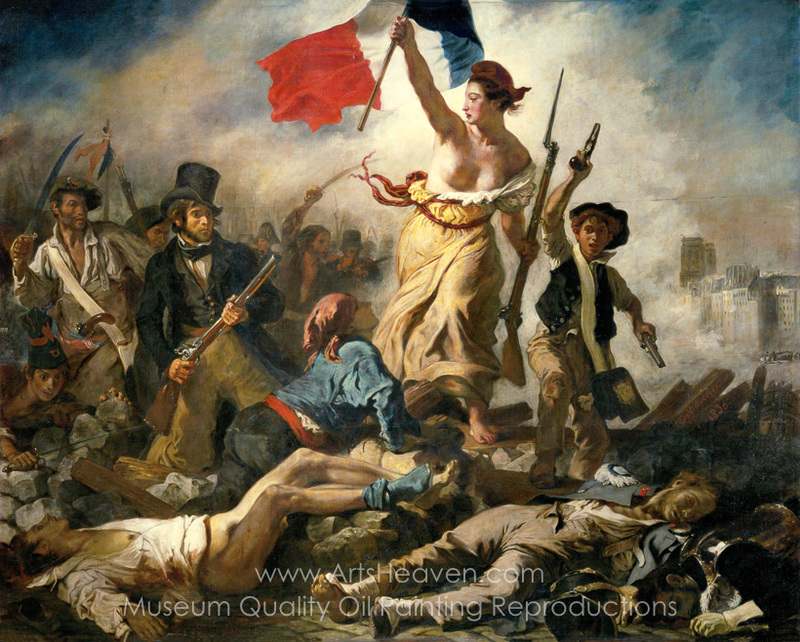 Decorate your home or office with our beautiful museum quality art reproduction of Eugene Delacroix Liberty Leading the People painting. Why settle for a print, poster, giclee or canvas transfer when you can grace your walls with a genuine oil on canvas painting reproductions for sale at up to 75% below gallery prices. You are commissioning an authentic hand-painted oil painting on quality artists canvas. Painted by professional artists brushstroke-by-brushstroke with attention to all details. Order your Masterpiece today and get Free Shipping to your door direct from our studio.